At 9:30 sharp the starting whistle blows. It’s an important moment. The first ever Boulder Finals in the history of the World Youth Championships, kicked off by the girls in the Female Youth B (Under 16) and Youth A (Under 18) categories. They compete simultaneously, 6 finalists per category. The game is even more delicate and serious than before: today there is simply no room for mistakes. Every attempt, every hold, every move must be studied seriously, calculated carefully. They’ll need to bank on all their brawn, brain and also that little bit extra. This is the game of bouldering, the kingdom of climbing that explodes with a bang. The tension is palpable, worthy of those great occasions, and quite rightly so! And finally they’re off. The beginning is always a crucial moment but boulder #1 doesn’t seem suited for a soft start and remains unclimbable for Slovenia’s Urska Repusic and America’s Brooke Raboutou. Her teammate Natalia Grossman fairs a little better, clinching the bonus zone in 6 attempts. Then the music plays to a radically different tune: Russia’s Elena Krasovskaia (3rd in the Semis) immediately tops out. Vita Lukan finds her way to the top on “only” her 4th attempt. At this point all eyes are on 14-year-old Ashima Shiraishi, the American who dominated the first two rounds. It goes without saying that everyone expects her to win. But will she withstand this pressure? The answer comes loud and clear: Ashima exits from isolation, glances at the problem and then promptly flashes it. She couldn’t get off to a better start. In the meantime Raboutou redeems herself by sending #2 in 6 attempts, while for Repusic and Grossman this problem remains an unsolved mystery. At this point Krasovskaia tries to make a breakaway by sending #2 in 2 attempts. Forcing Lukan and Shiraishi to respond… the pressure begins to mount. Lukan feels the strain but grits her teeth and sends it 4th go. Shiraishi then takes the stage and all of a sudden problem #2 has found someone capable of flashing it. It seems like a photocopy of the Semifinal. Which begs the question: will the young American produce a perfect performance? The time has come for the penultimate problem, boulder #3 which, interestingly, is the same as boulder #2 of the elder Youth A category. For Grossman, Repusic and Raboutou this overhang festooned with rounded volumes is… a black hole. Krasovskaia finds a little illumination by reaching a zone. Lukan clinches the top and demonstrates her superiority (yes, because in Cat A this top had only been climbed by Janja Garnbret). But the climber who seems to be in a league of her own is – no prizes for guessing -the usual suspect, Ashima Shiraishi. For her, completely naturally, the top is matched on her first attempt… easy peasy. Only one hurdle now remains, boulder #4, and the battle seems to concentrate on Krasovskaia and Lukan and their fight for silver. That is, unless there is no major upset by the American. This is a real possibility since the final problem starts with a long leap from left to right to a hold with looks anything but good. Grossman sends it almost with ease (on her 3rd attempt), followed by Repusic (in 7 attempts), while Raboutou fails on this last step to total a final score of 1 top (on problem #2). Elena Krasovskaia finds real inspiration and magically flashes the last problem, to finish with 3 tops in 4 attempts. Things now go to the wire, suddenly Vita Lukan with her 3 tops in 14 attempts has to send #4 to win silver and keep her dreams of gold alive (should Shiraishi falter). Who will manage to beat Slovenia’s Janja Garnbret? This is the first question of this final act of the Boulder World Championship Youth A (or Under 16). 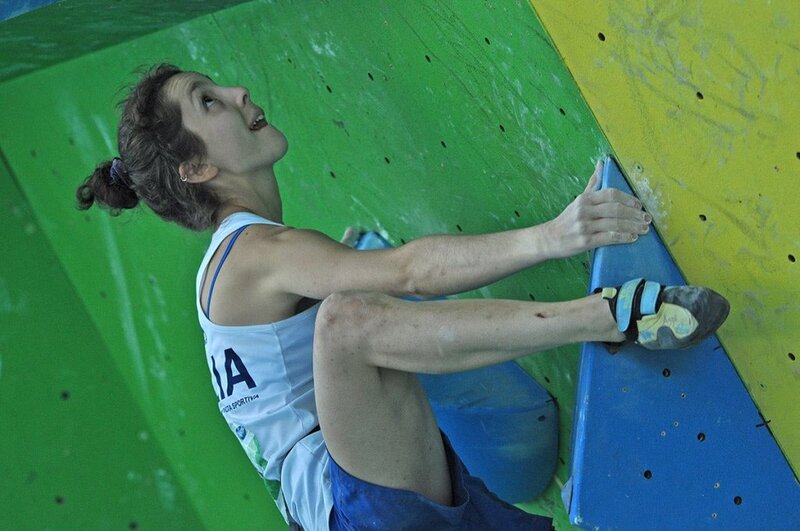 The second question, at least for the Italians: will Asja Gollo manage to repeat yesterday’s great climb in the Semis that netted her provisional 2nd? In the bouldering world, where nothing can be taken for granted, these are technical question everyone asks themselves. Garnbret is certainly one of the most talented athletes to emerge from youth competitions. A true champion. Gollo, for her part, has long been one of Italy’s rising stars and a force to be reckoned with on the international stage. It comes as no surprise that the Slovenian leads the World Ranking, is the defending European Champion, while the Italian trails in second place in the world ranking. And it’s not as if these two have no competition. On the contrary, the two Americans Margo Hayes and Grace McKeehan have proven to be tough nuts to crack and have their sights set very high indeed. And then there’s the Austrian Johanna Färber and France’s Charlotte Andre, two athletes whose countries’ sporting heritage is second-to-none. This preamble serves to underline the excitement that finals such as these produce. But at a certain stage there is no room for emotions, the climbers need to start climbing. And Asja Gollo and Margo Hayes get off to an astounding start, flashing #1. Things couldn’t go better. Janja Garnbret feels the pressure and needs two attempts to kickstart into action. While Johanna Färber sends it in 4 attempts, Charlotte Andre only manages to reach the zone and Grace McKeehan fails even lower still. On the difficult problem #2 only Garnbret reaches the top; she does so in style, flashing the boulder that remained a mystery for everyone else, even for Gollo and Hayes who at least managed to score a zone. To play things safe Garnbret flashes the overhanging puzzle #3. Only Hayes had succeeded like this, while Gollo had needed two attempts to top out. #3 is sent by Färber (in 7 attempts) and Andre (in 2 attempts). So with just one problem left, Garnbret is convincingly in the lead with 3 tops in 4 attempts. Second, with 2 tops in 2 attempts, lies Hayes. Third, with 2 tools and one attempt more than the American, is Gollo. So, as the best tradition has it, the race for overall gold is still on, anything can happen still. Except that the final overhanging and difficult problem proves to be such a serious test that it remains… unclimbed. 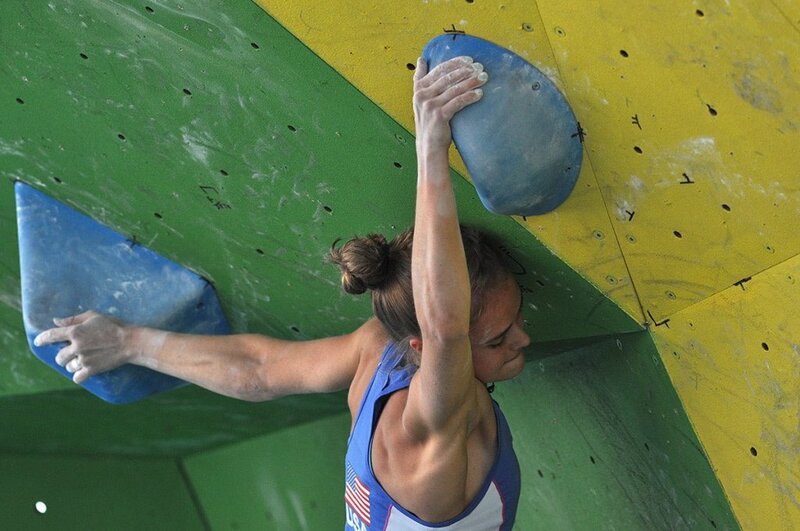 The end result: Slovenia’s Janja Garnbret is the great first Boulder Champion of Youth A. America’s Margo Hayes takes silver to demonstrate that the American “new school” is a force to be reckoned with. While excellent Italian Asja Gollo takes home a truly superb bronze! In the female Juniors competition the start is the best an athlete can dream of. On the overhanging boulder #1 four athletes manage the flash: Japan’s Miho Nonaka, Austria’s Jessica Pilz, Serbia’s Stasa Gejo and (naturally) Japan’s Miho Nonaka who “won” the Semis. 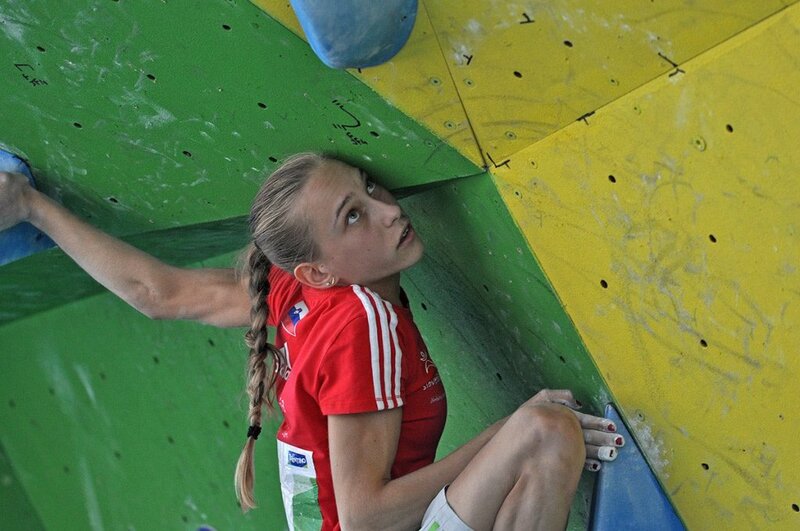 Chloé Caulier from Belgium reaches the top, but in 4 attempts. While Slovenia’s Julija Kruder remains empty-handed. On problem #2 things change, radically… The athletes need to breach the overhang using the holds that resemble a climber. Bizarre. Perhaps some remember those Arco Rock Junior days when they were kids. Except that this time no one has any fun whatsoever, seeing that no one manages to understand the problem, let alone climb it! Only Nonaka (in 2 attempts) and Pilz (in 3 attempts) manage to reach the zone, which puts them in provisional 1st and 2nd respectively. Until this point it’s been a rather strange competition, played out on the most delicate equilibrium imaginable. And on problem #3 (the balance red slab) things look no different, until Kruder reaches the zone. This is the same problem that only Youth B male finalist Filip Schenk had sent, and for the female athletes it seemed simply too much. Until Stasa Gejo pulled the rabbit out of the hat and, with absolute class, sends the top second go. So now it’s she – the only athlete with 2 tops – who has victory in her sight. But as usual things go to the wire on the 4th and final problem. Three athletes are still in the running for gold: Caulier, Pilz and Nonaka. But to do so they need to top out immediately, first go. That is, if Gejo doesn’t do so as well. Where Caulier and Pilz fail, Nonaka passes… 8th go. Too many to beat Serbia’s Stasa Gejo who, with 2 tops in 3 attempts, is the new Boulder Juniors World Champion – the title deservedly goes to this athlete. She is followed, with 2 tops in 8 attempts, by Japan’s Miho Nonaka who wins silver, while Austria’s Jessica Pilz beats Margaux Pucheux by just a zone to take bronze. Italy’s Filip Schenk and America’s Ashima Shiraishi are the Youth B World Champions; Keita Dohi from Japan and Elena Krasovskaia take silver, Lukas Franckaert from Belgium and Vita Lukan from Slovenia take bronze. 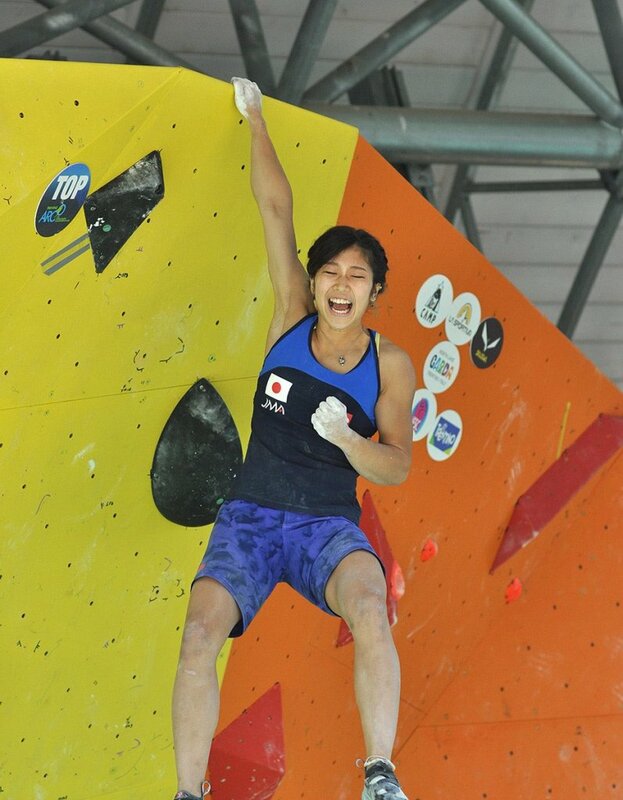 The Youth A (Under 18) Boulder Championship was won by Yoshiyuki Ogata from Japan and Janja Garnbret from Slovenia. Silver went to Kai Harada from Japan and Margo Hayes from the USA. Bronze went to Hugo Parmentier from France and Italy’s Asja Gollo. The Juniors world title was won by Jongwon Chon from South Korea and Stasa Gejo from Serbia. Second place went to Nicolas Pelorson from France and Miho Nonaka from Japan. Slovenia’s Anze Peharc and Austria’s Jessica Pilz.